This service synchronizes your photos, music, zips, videos, docs. between all your devices. You just have to save the file in the 4Sync folder and then you'll get immediate access to it from any device which has Internet connection. With 4Sync you share, transfer and back up files in a glimpse of an eye. 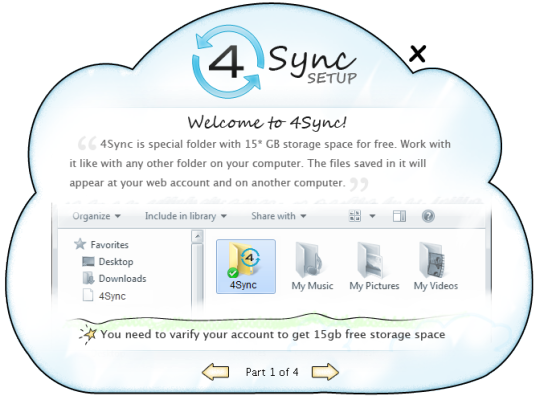 4Sync provides its users with backup copies of their files and ultimate secure work with their computers. Using 4Sync relieves you from fear of crashed computers, viruses, naughty kids or your personal absent-mindedness. Every user gets 15GB free storage space.